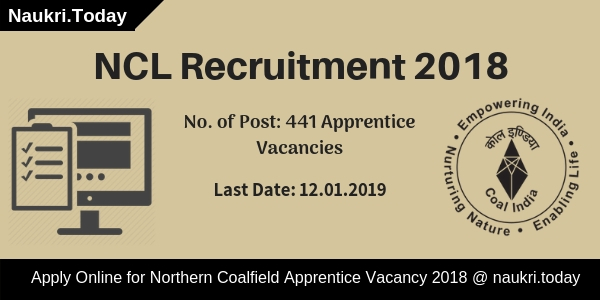 Northern Coalfields Limited has issued notification for recruitment of 441 Apprentice Vacancy in NCL Singrauli. Candidates who want to apply for NCL Recruitment 2018 may apply through online mode. The online application form is available here or official site. Those applicants going to fill NCL Vacancy Online form must apply before the last date. The last date of registration for NCL Apprentice Jobs is 12.January.2019. Rest of information such as eligibility criteria, application fees and selection process you can collect from below segment. Singrauli NCL is inviting online application form for 441 Apprentice Vacancy in Madhya Pradesh & Uttar Pradesh different unit. This is a golden opportunity for the candidates those are searching NCL Apprentice Recruitment 2018. 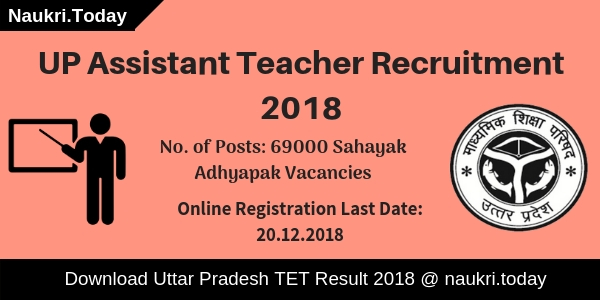 The starting date of submission Singrauli NCL Jobs 2018 online form is 10 December 2018. Applicants those are fulfilled eligibility criteria first, make registration on apprenticeship website. Then in below section, follow some instructions on how to apply for NCL Apprentice Vacancy 2018. Fresh Update as on 19.12.2018: Hello Friends, NCL Department has released notification for filling up 441 Apprentice Vacancies. Applicants may register for NCL Recruitment before the last date. Here we provided you with Complete details regarding NCL Vacancy 2018. Those candidates are interested in NCL Jobs 2018 must ensure that they fulfill eligibility criteria or not. Applicants who are belonging to MP & UP State only they can fill NCL Apprentice Bharti online form. Other remaining information such education qualification, age limit, and others are mention below. Welder: Applicants must pass 08th Class and have ITI Diploma in Welder Trade from NCVT or SCVT recognized Institute for NCL Recruitment 2018. Electrician: 10th Passed and have ITI Diploma in Electrician Trade from SCVT or NCVT recognized institute. Fitter: 10th with ITI Fitter Diploma recognized by NCVT or SCVT. Furthermore, check NCL Singrauli Apprentice Jobs 2018. The age criteria are decided as on 01.04.2018. Applicants should be completed 16 years if they are going to apply for NCL Recruitment 2018. The maximum age is required for NCL Apprentice Vacancy is 24 years. Upper age relaxation is applicable as per govt. norms. Selection of the candidates will be made on the basis of merit basis. The department will make merit list on the NCL Online Form 2018. The merit list will be made according to marks obtained in ITI. Participants those are belonging to General & OBC category must have minimum 50% marks in ITI. While SC/ST candidates must have minimum 45% marks. Furthermore, information checks official advertisement. Those candidates are selected for Northern Coalfield Vacancy also receive an attractive salary. You can check monthly income details on an official advertisement of Northern Coalfield Job 2018. There is no application form mention on the notification. After submission of application form candidates must ensure that there are any fees or not. Furthermore, collect from Singrauli NCL Job Notification. Applicants those are interested and fulfill eligibility criteria may apply through online mode. The online application form of NCL Apprentice Jobs 2018 is available from 10.12.2018 to 12.01.2019. Before going to apply online for NCL Vacancy applicants must have a scanned copy of all required documents. Candidates also have valid email id and mobile no. for Northern Coalfield Recruitment 2018-19. Firstly, the applicant goes to apprenticeship.gov.in. Registration first as an Apprentice on the site. Click on career tab and then click on Apply for NCL Apprentice Vacancy. Enter all require information such as educational & signature. Upload all documents mention above segment. Submit NCL Recruitment Application Form carefully. Conclusion: Northern Coalfield Limited has released an advertisement for employment of 441 Apprentice Bharti. Those applicants are interested and eligible for NCL Recruitment 2018 may fill the online form from 06.10.2018 to 12.11.2018. Full information of NCL Jobs 2018 for Apprentice Post you can collect from the above article. Northern Coalfields Limited has recently issued notification for employment of 839 Operators and various vacancies. 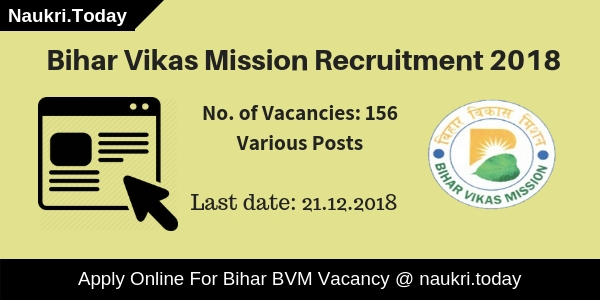 This is a great opportunity for candidates who are searching for Singrauli NCL Recruitment Notification 2018. Applicants may apply for Northern Coalfields HEMM Operator Vacancy either here or official site. The online registration form for Statutory posts will start on 03.09.2018 and HEMM Operator Post available on 10th September 2018. The last date of apply online for NCL Jobs both vacancies is 24th September 2018. Furthermore, information like eligibility criteria, pay scale and how to apply is mentioned in the below segment. Fresh Update as on 11.09.2018: NCL Singrauli Recruitment 2018 HEMM Operator Job Online Application Form is available from 10.09.2018 to 24.09.2018. Candidates can fill their application form through direct link mention below. Interested candidates who are going to fill online application form of NCL Recruitment 2018 must fulfill eligibility conditions also. Through the details of education qualification & age limit, you can check you are eligible or not for mention vacancy. hence, Read given below section for NCL Junior Overman Jobs 2018. Applicants should complete their Matriculation/SSC/High School or equivalent from recognized board. Candidates also have valid HMV license issued by RTO/RTA of Indian States. Furthermore, information checks Northern Coalfields Recruitment Notification 2018, which is mention below. Applicants who want to apply for NCL Recruitment 2018 should not be more than 30 years. Upper age relaxation is applicable for SC/ST/OBC category as per govt. norms. Applicants selection will be done according to their qualification and other factors. Full details available on your NCL Notification 2018, which is mention below. Interested and eligible candidates may apply for NCL Vacancy through online mode only. Before going to fill the application form applicants must have valid email id and mobile no. You also have done scan copies of your documents. After apply for NCL HEMM Operator Jobs you must send the printed copy of the online form. Now follow some easy steps to apply online for Northern Coalfields Recruitment 2018. First of all, go to the official site nclcil.in. Download NCL Notification 2018 through the link mention on site. Now Click on Apply Online for NCL Jobs 2018. Enter all required information like personal and others. Submit application fees if required. Now submit NCL Recruitment 2018 Application Form with correct information. Take two printouts of your NCL Online Form 2018. Keep one copy and another send to the department. Northern Coalfields Limited, Singrauli has issued recruitment notification for Clerk, Security Guard, Operator & other posts. NCL Recruitment 2018 invites applicants for filling up 664 vacancies. You can apply through offline mode. Interested and eligible candidates should download NCL Job application form from here. You can submit Northern Coalfields Limited Recruitment application form till last date 28.03.2018. Furthermore information you should read our full article. NCL Singrauli is released for filling up 664 Clerk, Security Guard & Other posts. Northern Coalfields Limited Notification has released for only department employees. Applicants who already work with the department, must download NCL Singrauli Vacancy application form from here. NCL Clerk Application Form should be received on or before 28.03.2018. Furthermore like eligibility criteria, application fees, selection process & others read given below section. Applicants who are want to apply for Clerk, operator & Security guard post, must working with department already. Other eligibility details of Singrauli NCL Grade III Recruitment is mention below. It includes details of education qualification, age limit and others. So all application who are interested for Northern Coalfields Limited Jobs, must ensure that they are eligible or not. For all NCL Grade III & Gr. II Vacancies : Applicants must completed their Matriculation or equivalent from recognized board. For Northern Coalfields Limited Security Guard Vacancy : Candidates should passed VIIth Standard. Rest details of qualification is mention on NCL Recruitment Notification. Read full notification carefully, which is also mention below. Eligibility of NCL Job Promotion : Any regular employee are eligible for fill application form. Applicants who have complete 03 years in the company may fill NCL Grade III application form. Furthermore check Northern Coalfields Limited Vacancy Notification, available below section. Applicants selection will be based according to their experience and test. Applicants who are apply for NCL Singrauli Grade III Recruitment selection criteria is written test. Other employees will selected according to performance in test or normal selection. Furthermore check NCl Security Guard Job Notification 2018. NCL Clerk Job comprises 100 multiple choice questions. Each question carry 01 mark. The exam duration will be 120 minutes. In NCL Grade III Vacancy no negative marking for wrong answers. Applicants who are going to attend Northern Coalfields Grade III Examination, should passed with minimum qualifying marks. For successful selection applicants should get minimum marks. The detail of NCL Clerk Job marks mention below. Interested and eligible candidates may apply through prescribed application form. The NCL Job application form is available here or official site. You can also follow given information how to fill NCL Grade III Vacancy form. The steps of apply for Northern Coalfields Limited Vacancy is mention below. First of all applicants go to official site nclcil.in. After that go recruitment section. Download NCL Vacancy Application Form from there. Read the advertisement carefully. All required information available there. Then again visit site and download NCL Recruitment Application Form. Fill it with ball pen and paste photograph. Give signature in appropriate place on application form and admit card. Duly fill application form & admit card along with required documents send to below address. You can direct download NCL Application Form & NCL Singrauli Admit Card through below link. Conclusion : NCL Recruitment 2018 for 664 Clerk, Security Guard, Operator and other posts. Interested and eligible candidates may apply through the prescribed application form. NCL Security Guard Application form already available offsite from 08.03.2018. The last date of submitting Northern Coalfields Limited Recruitment form is 28.03.2018.